George Joseph Hovanitz was called to Heaven after 96 wonderful years. George peacefully met the Lord while surrounded by family on Sunday, December 3, 2017. George was born May 3, 1921 to Frank and Stephania. He dedicated his life to civil service and compassion for his community and family. He is a US Veteran of the Army/Airforce and was stationed primarily in Nome, Alaska. 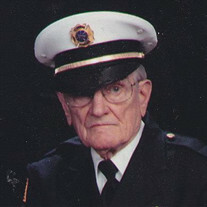 He spent over 40 years as a Sheffield Township Fireman and EMT; retiring as Assistant Fire Chief at the age of 82. George was a founding member and committed parishioner of St. Vincent De Paul Catholic Church, Elyria. His alma mater was Clearview and he played on the 1st Clearview High school football team. George was a sincere man, abundant in love of family. He maintained his commercial pilots license for many years. He was preceded in death by his parents. He was a loving husband, preceded in death by his first wife, Helen Hovanitz in 1969; second wife, Elaine Hovanitz in 1994; and fiancé, Dorothy Tomusko in 2014, great granddaughter, Glory; brothers, Edward, Frank and John; and sisters, Stella and Irene. Devoted father to George R., James (Sandy), Ted (Ruth), Edward (Deborah); stepfather to Susan (Jerry) Puka, Faith (Rick) Maybaugh and Shiela Cottrell; grandfather to Darrell, Rose (Charles), Christina, Matthew (Katelyn), Janet, Stephanie (Bobby), Heather (Lewis) and Nicholas; blessed great grandfather to Eric, Alex, Brandon, Lana, London, Heath, Llayton, Llayla, Bodhi and Jacob. The family will receive friends on Tuesday, Dec. 5, 2017 from 6-8 pm in the Dovin Funeral and Cremation Specialists, 2701 Elyria Avenue, Lorain, where funeral service will be held on Wednesday, at 9:30 am followed by a Mass at 10:00 a.m. at St. Vincent de Paul Catholic Church, 41295 North Ridge Road, Elyria. Rev. Donald Dunson, pastor will officiate. Burial will follow in St. Mary Cemetery, Avon. To send online condolences go to www.dovinfcs.com.